ISLAMABAD: The Met office Wednesday forecast cold and dry weather for most parts of the country while light rain (with light snowfall over the hills) is expected at few places in Malakand division, Gilgit-Baltistan, Kashmir and its adjoining hilly areas. Foggy conditions are likely in plain areas of Punjab and upper Sindh during morning hours. According to the synoptic situations, a westerly wave is affecting northern parts of the country and may persist till next 24-36 hours. Scattered rain (with snowfall over the hills) occurred in upper Punjab, upper Khyber Pakhtunkhwa, Islamabad, Gilgit-Baltistan and Kashmir during last 24 hours. Punjab: Okara 40, Sargodha (City 24, A/P 15), Lahore (A/P 18, city 12), Murree 15, Gujrat 17, Islamabad (Saidpur 11, Z.P 06, IIAP 05, Bokra, Golra 03), Sialkot (A/P 10, City 001), Gujrat 09, Rawalpindi (Shamsabad, Chaklala 05), Mianwali, Chakwal 05, Layyah, Kamra 04, Narowal 03, Bhakkar 02, Khyber Pakhtunkhwa: Dir (Lower 20, upper 12), Malamjabba, Saidu Sharif 19, Mirkhani 16, Parachinar 15, Balakot 08, Pattan, Kalam 07, Drosh 06, Bannu 05, Kakul, Chitral 04, Risalpur 03, Cherat 02, Kashmir: Kotli 20, Muzaffarabad 12, Rawalakot 10, Garidupatta 06, GB: Bunji 05. 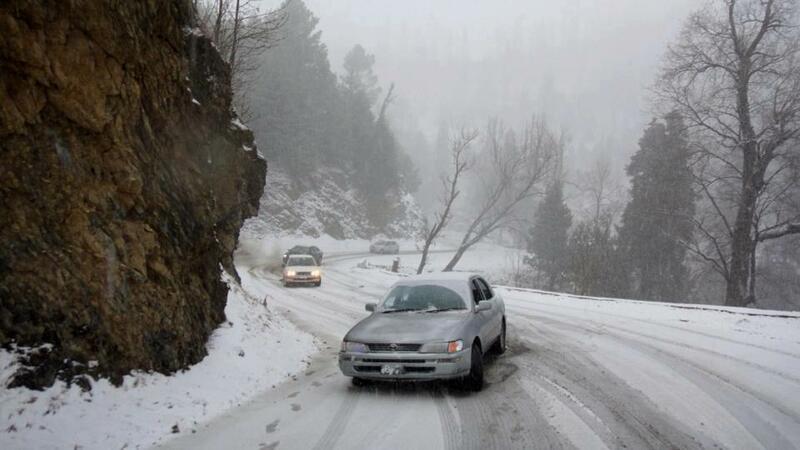 Snowfall (Inch): Malamjabba 11, Murree 10, Kalam 06. Ziarat -13°C, Kalat -11°C, Skardu -09°C, Quetta, Gupis -06°C, Bagrote, Kalam, Astore, Malamjabba -05°C, Murree, Dalbandin -03°C, Zhob, Hunza, Drosh, Parachinar -02°C, Nukkundi, Rawalakot, Chillas -01°C,Islamabad 04C, Peshawar 08C, Lahore 05C.